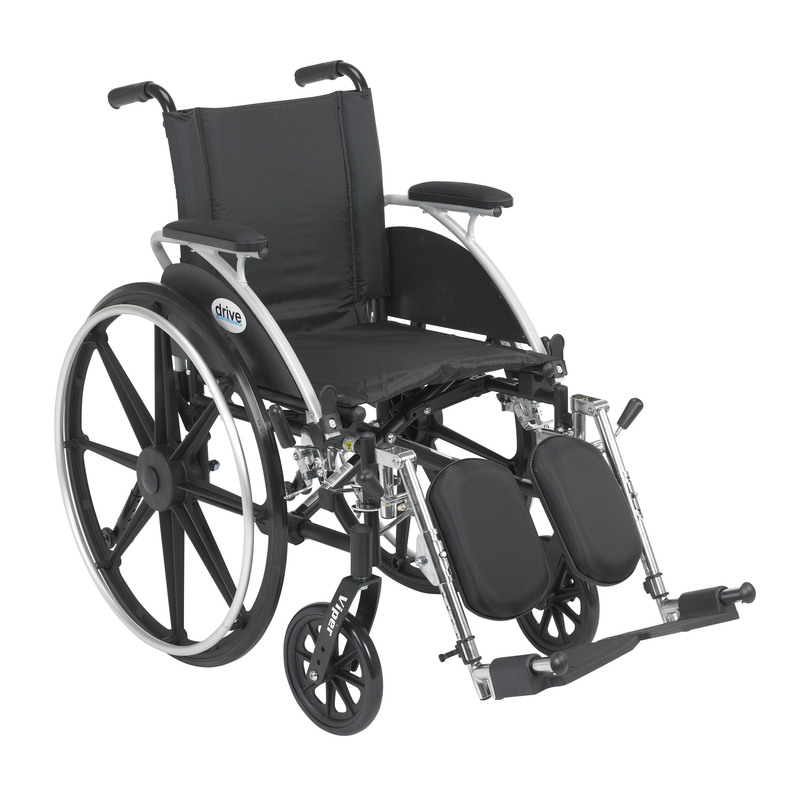 Viper Wheelchair with Flip Back Removable Arms | Mountain Aire Medical Supply, Inc. The Drive Medical Viper is a versatile wheelchair right out of the box and it is easier to propel and transport than an average weight wheelchair. The Viper comes standard with adjustable padded arms, multiple seat to floor height positions, anti-tippers with flip-up wheels which never have to be removed and push to lock wheel locks. The back is height adjustable to provide added patient comfort. The carbon steel frame is high strength while remaining lightweight. The wheelchair upholstery is made of durable nylon for long lasting comfort and cleanliness. These comfort options make the Viper from Drive Medical an ideal wheelchair for anybody that needs to be in a wheelchair for extended periods of time. This wheelchair comes with flip back removable desk arms, elevating leg rests, and a 12" wide seat. Back height adjustable from 18"-20"
Armrest to Floor Height: 21.5"
Folded Dimensions: 36" x 12" x 32"
Overall Length w/ Riggings: 36"
Seat to Armrest Height: 6"
Seat to Floor Height: 13.5"-15.5"